Uncharacteristically stumped for a Slice for the midweek period I turned to a familiar corner I went past all the time when I worked in the Penn Station area between 1988-1991 and again from 2000-2004, a grungy, grimy, gritty mid-Manhattan intersection just south of Penn Station on 8th Avenue, perhaps my least favorite of all of NYC’s north-south routes. This may come out occasionally in FNY but I’m no fan of sweat, grease, dirt and the reminders that there is occasional nastiness: I break from many colleagues in the ‘urban exploration’ circuit in applauding the overall cleanup of Times Square, for example. Eradicating graffiti from the subways was a master stroke. Losing the squeegie guys. Enforcing regulations against public urination. I can go on. 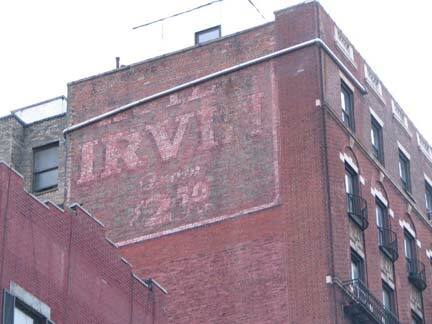 The Irwin’s modern-day equivalent is the Chelsea Star Hotel on the corner at 300 West 30th. Not everyone who comes to town can stay at the Hilton (I can’t say Plaza any more) and the Chelsea Star is one of those places that cater to a budget-minded clientele near Penn Station. Reviews are all over the place. What are those things bolted into the exterior wall? 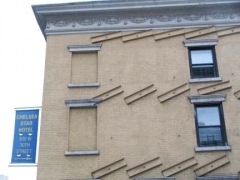 They help hold the building together, I know, but what do they do, exactly? And, why are windows so often bricked up? ForgottenFan Hector Cepeda: Those are seismic retrofit supports to prevent lateral failure of the building structure … the exterior wall brackets are connected to rods that run horizontally through the spaces between the floors and ceilings. The rods are anchored at their other ends to structural beams or to an adjacent building. All of this effectively clamps the building together. This kind of fix won’t cover all types of seismic events, but it’s something that’s accepted in lieu of complete demolition. ForgottenFan William Hohauser: Frequently in old buildings (80+ years and older), the apartments had a common hall bathroom on each floor that the tenants shared. When that started to be unacceptable and private bathrooms were demanded by renters, landlords had to find room in apartments that were never designed to have a toilet, bath or shower. The big giveaways are bricked up windows with a small window inside the original space. 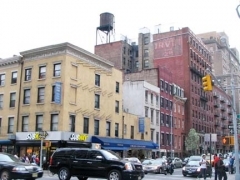 Other apartment buildings were designed originally as long term hotels and while they might have had private bathrooms, there were no private kitchens as the tenants ate in a common dinning room served by a staff run kitchen. Totally bricked up windows could serve as clues to where the landlord sacrificed a window in order to install wall cabinets, a sink, an oven and a refrigerator. 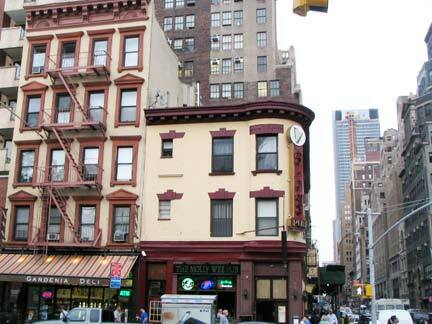 I lived in a 1890’s era building like this for a time and I had a friend who lived in a building just off Times Square where the tenants had to still share a hall bathroom in the 1990s! 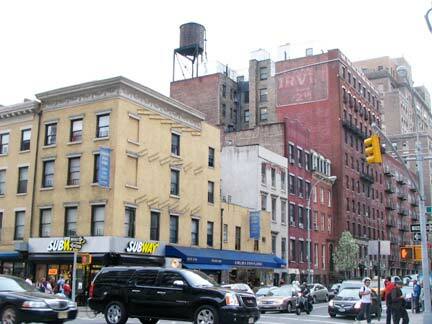 NW corner, a pair of older buildings that have been resurfaced over the last couple of decades. 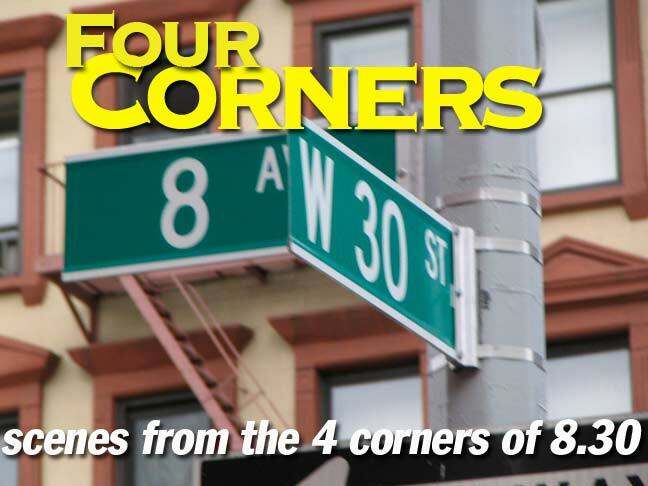 The corner is home to a competing budget hotel, the Manhattan Inn Hostel at 303 West 30th. Mixed reviews again. (When traveling I tend to be a B&B guy, but since I’ll admit I’m not all that gregarious, I usually creep down to the kitchen at 9AM after the other guests have left!) 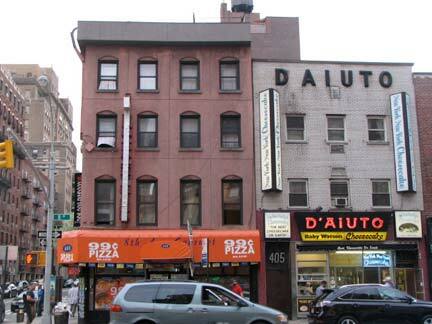 RIGHT: D’Aiuto, with not one but two old-school signs, one in big vinyl letters and the other in day-burning neon, produces the well-reviewed Baby Watson cheesecake. 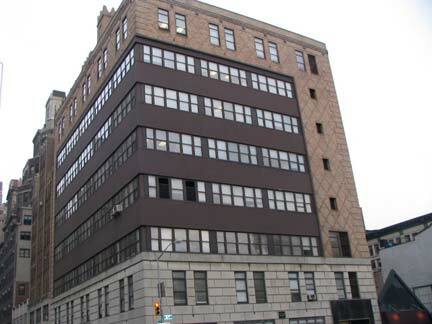 the intimidating 400 8th Avenue, home of NYC Human Resources Administration and Department of Social Services, which is a place your webmaster hopes that I never have the opportunity to visit. Page completed April 28, 2010. Your site rocks! As an ex-pat NY native it is a treat to see these updates on Facebook! I spend a lot of time around here, rehearsing at 251 30th Street. 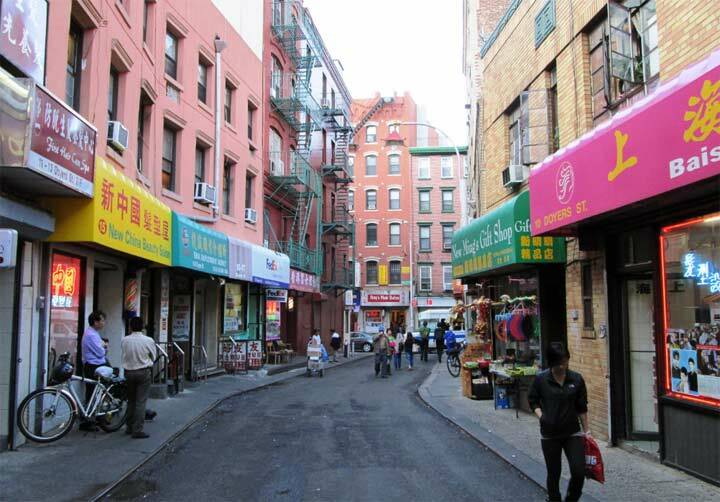 Have you done any slices about the musical nature of 30th between 7th and 8th? I do trust all the concepts you have presented for your post. They’re really convincing and can certainly work. Still, the posts are very brief for newbies. May just you please lengthen them a little from next time? Thanks for the post. I used to be suggested this blog by way of my cousin. I’m now not positive whether this post is written by him as no one else recognise such unique approximately my difficulty. You are incredible! Thanks!